Objective To provide an overview of non-pharmacological interventions for behavioural and psychological symptoms in dementia (BPSD). Design Systematic overview of reviews. Data sources PubMed, EMBASE, Cochrane Database of Systematic Reviews, CINAHL and PsycINFO (2009–March 2015). Eligibility criteria Systematic reviews (SRs) that included at least one comparative study evaluating any non-pharmacological intervention, to treat BPSD. Data extraction Eligible studies were selected and data extracted independently by 2 reviewers. The AMSTAR checklist was used to assess the quality of the SRs. Data analysis Extracted data were synthesised using a narrative approach. Results 38 SRs and 142 primary studies were identified, comprising the following categories of non-pharmacological interventions: (1) sensory stimulation interventions (12 SRs, 27 primary studies) that encompassed: acupressure, aromatherapy, massage/touch therapy, light therapy and sensory garden; (2) cognitive/emotion-oriented interventions (33 SRs; 70 primary studies) that included cognitive stimulation, music/dance therapy, dance therapy, snoezelen, transcutaneous electrical nerve stimulation, reminiscence therapy, validation therapy, simulated presence therapy; (3) behaviour management techniques (6 SRs; 32 primary studies) and (4) other therapies (5 SRs, 12 primary studies) comprising exercise therapy, animal-assisted therapy, special care unit and dining room environment-based interventions. Music therapy was effective in reducing agitation (SMD, −0.49; 95% CI −0.82 to −0.17; p=0.003), and anxiety (SMD, −0.64; 95% CI −1.05 to −0.24; p=0.002). Home-based behavioural management techniques, caregiver-based interventions or staff training in communication skills, person-centred care or dementia care mapping with supervision during implementation were found to be effective for symptomatic and severe agitation. Conclusions A large number of non-pharmacological interventions for BPSD were identified. The majority of the studies had great variation in how the same type of intervention was defined and applied, the follow-up duration, the type of outcome measured, usually with modest sample size. Overall, music therapy and behavioural management techniques were effective for reducing BPSD. Non-pharmacological interventions have gained increasing attention in recent years as an alternative first-line approach to treat behavioural and psychological symptoms in dementia (BPSD). The strength of this review is its extensive, comprehensive systematic search of studies that investigated non-pharmacological interventions for BPSD. It provides a compendium of the types of non-pharmacological interventions, including the component of each single intervention, the dosage (when available) and the duration of the treatment. Primary studies were generally of limited sample size; there was substantial variation in the characteristics of the intervention and the authors of primary studies reported different conceptual frameworks, and sometimes broad, and quite generic descriptions, of the interventions. Dementia is a neuropsychiatric syndrome characterised by cognitive decline and progressive deterioration of daily function, often associated with behavioural disturbances. The prevalence of dementia in older participants is reported to be ∼6% worldwide1 and, with global population ageing, it is expected to rise, although some recent studies have suggested declining trends in dementia frequency.2 Dementia presents a considerable burden to families and caregivers and is becoming a major challenge for all healthcare systems, as well as for society at large.3 ,4 Alzheimer's disease (AD) is the most common form of dementia in older people, accounting for 60% of cases. The purpose of the present overview is to assess the evidence supporting these non-pharmacological interventions with a view to providing a working compendium for the non-drug management of BPSD. The search sources included the Cochrane Database of Systematic Reviews, PubMed, PsycINFO and CINAHL (see online supplementary appendix 1). Two criteria were considered for further evaluation of an abstract: (1) a paper defined as a review or a meta-analysis; (2) the use of any non-pharmacological intervention to treat behavioural disturbances in patients with dementia. The publication years ranged from 2009 to March 2015. Subsequently, full-texts of relevant abstracts were obtained and screened to identify SRs of interest based on (1) the use of at least one medical literature database; (2) the inclusion of at least one primary study and (3) the use of at least one non-pharmacological intervention to treat behavioural disturbances in people aged 60+years. We assessed the methodological quality of each SR using the AMSTAR (A Measurement Tool to Assess Reviews) instrument that contains 11 items.39 Final grading of the methodological quality of each SR was based on the overall score and reported as either ‘high’ (score≥8), ‘medium’ (score 4–7) or ‘low’ (score≤3). Two reviewers independently assessed the quality of the SRs, and disagreements were resolved by consensus. From each SR, the following data were collected: the publication year, the databases searched, the study population, the non-pharmacological interventions, the number of primary studies included, the outcome measures and the AMSTAR score. Pairs of reviewers independently screened titles, abstracts and full texts of articles. Disagreements were resolved by discussion or, where necessary, by consulting another author. We focused on reviews that considered BPSD, as a primary outcome, measured by (1) multidomain scales (eg, Neuropsychiatric Inventory (NPI), Brief Psychiatric Rating Scale, BPRS), (2) scales specific to agitation (eg, Cohen-Mansfield Agitation Inventory, CMAI) and (3) scales specific to depression or anxiety (eg, Cornell Scale for Depression in Dementia, CSDD). We used the Cochrane Collaboration method to evaluate the risk of bias. The domains considered were random sequence generation, allocation concealment,40 blinding of participants, personnel, or outcome assessor,40 incomplete outcome data,41 selective reporting42 and other potential biases (eg, balance in baseline characteristics). The overall quality of evidence was assessed using the GRADE (Grading of Recommendations, Assessment, Development and Evaluation) methodology that takes into account the risk of bias, consistency of results across the studies, precision of the results, directness and likelihood of publication bias.43 Results regarding the risk of bias assessment, and grading the quality of evidence, will be provided in a companion paper. Our search strategy identified 4392 abstracts of which 2549 were duplicates and were subsequently removed. After abstract screening, 67 records were identified for full-text assessment. Of these, 38 reviews were included in this overview. From these SRs, we obtained 142 primary studies from which we abstracted details of the non-pharmacological interventions. Figure 1 shows the study screening process. Table 1 depicts the basic characteristics of the included SRs. The characteristics of relevant primary studies are reported in online supplementary appendix 2 as electronic tables (etable). The AMSTAR evaluation are summarised in online supplementary appendix 3. The interventions in this overview were classified according to the following categories: (1) sensory stimulation interventions that encompass acupuncture, aromatherapy, massage therapy, light therapy, sensory garden intervention, cognitive stimulation, music/singing and dance therapy, snoezelen and transcutaneous electrical nerve stimulation (TENS) therapy; (2) cognitive/emotion-oriented interventions that include reminiscence therapy, validation therapy, simulated presence therapy (SPT); (3) behavioural management technique and (4) other interventions, such as exercise therapy, pet-therapy and special care unit. Only one SR was identified. Robinson 201144 (AMSTAR=7) investigated the evidence available for shiatsu and acupressure in BPSD. Shiatsu is a form of complementary medicine primarily developed in Japan, which employs gentle manipulations, stretches and pressure with the fingers, elbows, knees and feet. Acupressure is similar, but exerts pressure for longer on specific meridian points according to traditional Chinese medicine or acupoints of the human body in order to ‘balance energy fields’. The authors identified 40 RCTs, 8 controlled clinical trials, 5 crossover trials, 6 within-participants studies, 1 observational study, 10 uncontrolled studies and 1 prospective study. Only one randomised trial (n=133 participants) using acupressure in dementia participants was relevant for our assessment.45 The authors reported that agitation, aggression and physically non-aggressive behaviour all declined significantly in demented participants. Aromatherapy is proposed as a complementary intervention, to treat a wide-range of health problems, including lack of sleep and behavioural symptoms for people with dementia.46 Aromatherapy is based on the use of plant products or aromatic plant oils to produce essential oils and blends of aromatic compounds. Aromatherapy can be delivered through massage or topical application, inhalation and water immersion. The most recent SR was a Cochrane review,48 which had the highest AMSTAR quality score (8). The review included only randomised trials and launched its last search strategy in January 2013. Seven studies with 428 participants were identified. The types of interventions included lavender-based (four studies49–52), Melissa-based (two studies53 ,54) and lemon balm oil (1 study) aromatherapy. However, only two of these had usable data for pooling. The first study (n=71) reported a favourable treatment effect on measures of agitation (MD −11.1, 95% CI −19.9 to −2.2) and behavioural symptoms (MD −15.8, 95% CI −24.4 to −7.2), whereas the second trial (n=63) did not detect any difference in agitation (MD 0.00, 95% CI −1.36 to 1.36) or behavioural symptoms (n=63, MD 2.80, 95% CI −5.84 to 11.44). The review authors remarked that the published studies used different scales to assess the behavioural symptoms and were limited in sample size and methodological quality, particularly because of selective reporting bias. The second review by Seitz et al29 consisted of any non-pharmacological interventions, including aromatherapy, to treat outcomes relevant to patients with dementia. The review reported data in a narrative way and cited only one study of aromatherapy,53 which was also included in the Cochrane review above.48 The review received an AMSTAR score of 6. The third study was a review by Fung et al,47 which considered only aromatherapy as a non-pharmacological intervention. The review was judged to have moderate methodological quality (AMSTAR score=6). After performing a comprehensive search in several electronic databases, 11 studies were identified, with a total of 405 patients in different settings, including long-term care (LTC) homes, clinical centres and general and old age psychiatry. In addition to the trials included in the above cited Cochrane review, the review by Fung et al47 included one randomised trial55 which was excluded in the Cochrane review because the route of administration was not reported and there was no mention of the type of the aromatherapy, in addition to five controlled clinical trials.56–60 Moreover, the Fung et al review47 did not include the two trials49 ,51 ,61 that were evaluated in the Cochrane review. The controlled clinical trials could not be included in a meta-analysis because of heterogeneity. The review highlighted the methodological limitations of the studies and reported promising results of aromatherapy. Online supplementary etable 1 describes the type of interventions, the outcomes and the results of the primary studies included in the aromatherapy reviews. Two reviews were identified. The first was a Cochrane review63 that was included in the review by O'Neil et al.31 This review assessed the efficacy of massage and touch therapy for the treatment of BPSD. Its last search strategy was launched in 2006. The aim of the overview was to evaluate the effects of a range of massage and touch therapies on conditions associated with dementia, such as anxiety, agitated behaviour and depression, to identify any adverse effects and to provide recommendations for future trials. The review considered only randomised trials. The primary outcome measures were changes in the frequency and severity of various types of agitated behaviour, as observed by staff or investigators (short-term and long-term using any rating method), and the emotional well-being and the quality of life of the patients (rated by staff, investigators and/or patients themselves using any method). Remington (2002)64 assessed the effect of music and massage in 68 nursing home residents with dementia (AD, multi-infarct dementia or senile dementia). The participants were randomly allocated into four groups: calming music, hand massage, simultaneous calming music and hand massage and no intervention. The intervention lasted 10 min and was given to each patient once. The efficacy of treatment on ‘agitation level’ was evaluated with a modified version of the CMAI administered by trained research assistants who were blinded to treatment allocation when possible. The method of randomisation was unclear and to conceal allocation, sealed envelopes, without further explanation, were used. However, patients could have been excluded after allocation (if they had a CMAI score of 0 at baseline) and consequently the study was considered to have high risk of selection bias. The trial found that agitated behaviour decreased, more so in the group receiving hand massage than in the group receiving no treatment. This treatment effect was consistently found, compared to baseline, for measurements taken during treatment, immediately after treatment and 1-hour after treatment, and it was practically identical among the three groups receiving treatment (hand massage, calming music or both). The mean agitation score was in favour of massage therapy immediately after treatment (MD 7.83 (4.30 to 11.36)) and 1-hour after treatment (MD 12.12 (6.58 to 17.66)). The second review by Moyle et al65 conducted a search in 10 databases in October 2011. The authors identified 13 studies that evaluated massage therapy for the treatment of behavioural disturbances in patients with dementia, but only one study with a high methodological score, using the Validity Rating Tool, was identified. The included study, performed by Holliday-Welsh,66 was a prospective before–after study in which 52 participants (39 women and 13 men; mean age 90 years) from two skilled nursing facilities in Northeastern Minnesota, USA, were enrolled. Patients were cognitively impaired and had a history of agitated behaviour confirmed by the facility staff. The intervention consisted of a 10-min to 15-min massage of the upper extremities (including the head, shoulders and hands), undertaken by a physical therapy assistant, during a 1-hour period identified by caregivers as the time the participant was usually most agitated (individualised for each participant). The outcomes of interest were assessed with a scale that used the five behavioural symptoms from the minimum data set; (1) wandering; (2) verbally abusive behavioural symptoms; (3) physically abusive behavioural symptoms; (4) socially inappropriate/disruptive behaviour and (5) resistance to care. Methodologically, the study was considered at high risk of selection and performance bias given the study design and the nature of the intervention. In addition, it was unclear whether the outcome assessor was blinded. Massage therapy was significantly associated with improvement for four of the five outcomes examined, including wandering (0.38 vs 0.16, p<0.001), verbally agitated behavioural symptoms (0.59 vs 0.49, p=0.002), physically agitated behavioural symptoms (0.82 vs 0.40, p<0.001) and resistance to care (0.10 vs 0.09, p=0.022). Online supplementary etable 2 describes the type of interventions, the outcomes and the results of the primary studies included in the massage therapy reviews. Four reviews considered the use of bright light therapy to treat behavioural problems in patients with dementia. The first was a Cochrane review67 (AMSTAR=10) with the aim of evaluating the effectiveness of light therapy to improve cognition, activities of daily living (ADLs), sleep, challenging behaviour and psychiatric disturbances associated with dementia. The search strategy was launched in January 2014. The included studies were randomised trials that compared any bright light therapy, including dim red light or dim, low-frequency blinking light <300 lux, to usual care. The primary outcome measures included cognition (global or single domain, eg, memory), ADLs, sleep-wake disturbances, challenging behaviour (eg, agitation), psychiatric disturbances (eg, depression) and adverse effects. Secondary outcomes were rates of institutionalisation and overall cost of care. The authors identified 11 studies, but stated that three of the studies could not be included in the analyses either because the data were insufficient or could not be retrieved from the trial authors. Only four of the included studies considered challenging behaviour as an outcome, but the sample sizes were limited and the outcome measures were not the same across the studies.68–71 A meta-analysis of challenging behaviour, however, was performed and no substantial heterogeneity was found, although the results were not statistically in favour of bright light therapy. The second review aimed to identify which non-pharmacological interventions were most effective for BPSD in LTC.29 Only two studies68 ,69 were included in the review (which were already included in the Forbes review67), but were not assessed in detail. The review received four points in the AMSTAR rating system. The third review72 aimed to assess the role of physical environment in supporting person-centred dining in LTC. Only one study that evaluated the effect of ambient bright light in activity and dining areas among institutionalised people with dementia was identified.73 This study was not included in the previous two reviews. The fourth review74 that addressed the effectiveness of environment-based interventions for people with AD or dementia identified a cluster-unit crossover trial.75 The trial was conducted in two geriatric units in a state-operated psychiatric hospital and in a dementia-specific residential care facility in Oregon, USA, and enrolled 66 older adults with dementia to evaluate the effectiveness of ambient bright light therapy, delivered through a high-intensity, low-glare lighting system installed in the public areas of study units at both sites, at reducing depressive symptoms. Each lighting condition was provided for multiple 3-week periods in a predetermined sequence. The CSDD was used to assess depressive symptoms. Results did not support the use of ambient bright light therapy as a treatment for depressive symptoms in people with dementia.75 Online supplementary etable 3 describes the type of interventions, the outcomes and the results of the primary studies included in the light therapy reviews. Whear 2014 76 (AMSTAR=7) investigated the impact of gardens and horticultural therapy on the mental and physical well-being of residents with dementia, in nursing homes and specialised dementia care facilities. This approach uses either ‘sensory’ gardens to stimulate the five senses (sight, vision, hearing, smell and touch), or plants and plant-related activities to improve well-being (horticultural therapy or therapeutic horticulture). Eighteen studies were identified: ten were quantitative studies (two RCTs (n=34), six pre-post studies, one crossover study, one prospective cohort study), seven qualitative and one used mixed methods. In one of the RCTs,77 there was a non-statistically significant decline in verbal and physical aggression and non-verbal aggression, and total CMAI score (Online supplementary etable 4). Online supplementary etable 4 describes the type of interventions, the outcomes and the results of the primary studies included in the sensory garden and horticultural activities reviews. Six SRs that evaluated music therapy,29 ,81–85 and one review that assessed live singing to people affected with dementia,80 were identified. The number of included primary studies in the reviews varied from 3 to 18, and the AMSTAR scores of the reviews ranged from 2 to 7. The review by Ueda 201382 received the highest score (AMSTAR=7) and included nine randomised trials and nine controlled clinical trials that evaluated one music-related experience or a combination of music-related experiences, such as singing, listening, performing, rhythmic exercising and improvising. Uncontrolled before-and-after studies and case studies were excluded. Music therapy was effective in reducing behavioural symptoms (6 RCTs+5 CTs; 397 participants) (SMD=−0.49 (95% CI −0.82 to −0.17)), despite a moderate and statistically significant heterogeneity (I2=58%, p=0.009). The same intervention achieved a statistically significant reduction on depression (4 RCTs+5 CTs; 250 participants) (SMD=−0.32 (95% CI −0.68 to −0.04); I2=44%, p=0.08) and anxiety (SMD −0.64, 95% CI −1.05 to −0.24; I2=55%; eight studies; 258 participants). Whear et al85 investigated the effectiveness of mealtime interventions, including music, on BPSD in people with dementia in residential nursing homes or care homes. Eleven studies were identified: one controlled trial, three before/after studies and seven repeated measure time series studies. The results of the studies were described narratively. One before/after study with 22 participants found that music played at mealtime improved physical and verbal, aggressive and non-aggressive, behaviour using the CMAI. The review by Wall and Duffy84 included 13 studies that were presented narratively. The review was of low quality (AMSTAR score 2). The review by Chatterton et al80 evaluated the efficacy of ‘live’ singing to people with dementia for cognitive, behavioural, physiological and social outcomes. The study received an AMSTAR score of 1. An additional SR72 that aimed to assess the role of the physical environment in supporting person-centred dining in LTC identified four non-randomised studies, with different designs, that evaluated the effect of music on the incidence of agitated behaviours during mealtimes, among older adults with dementia, residing in special care units (SCUs).110–113 The results of these studies showed that playing music during mealtime reduced the incidence of agitated behaviour. Online supplementary etable 5a describes the type of interventions, the outcomes and the results of the primary studies included in the music therapy reviews. Two reviews evaluated dance therapy in patients with dementia.114 ,115 The first review's objective was to evaluate the evidence concerning dancing interventions in physical and mental illnesses compared to other types of interventions or non-specific interventions.115 The review received 3 points in the AMSTAR scoring system and identified 13 small studies reporting results from 11 randomised trials of which only one considered patients with dementia. The trial that considered participants with dementia included 29 participants (mean age 79 years, SD 7.7; 75% women) in a nursing home and evaluated the efficacy of dance and movement therapy delivered in nine sessions, lasting 30 to 45 min each, once-a-week.116 The outcome measures included the word list savings score, the Clock drawing test (for visual spatial ability), the Cookie Theft picture description task from the Boston Diagnostic Aphasia test and the Nurses' Observation Scale for Geriatric Patients (NOSGER). The results did not show any important differences in favour of dance therapy. The second SR aimed to evaluate the effects of dance (movement) therapy and ballroom dancing, compared to usual care, for adults with physical and mental illnesses.114 The review received only one point on the AMSTAR Scale and identified only one study that investigated the intervention in a population affected by dementia116 and which was also included in the review above. The first was an overview of reviews,31 and its evidence for SMST was based on a Cochrane review that included three studies.117 The inclusion criterion was any randomised trial that assessed the efficacy of SMST and/or multisensory stimulation to treat people over 60 years of age suffering from dementia. The outcomes of interest included behaviour, mood, cognition, physiological indices and client–carer communication, as well as short-term effects measured during the sessions or postsession, and longer term benefits measured postintervention and at follow-up. The three included primary studies evaluated a total of 311 patients with dementia, aged 60 or older. The first was a randomised trial118 that compared eight standardised multisensory programmes with eight standardised activity sessions. Both programmes were implemented on a one-to-one basis, twice-a-week, with each session lasting 30 min. Fifty participants (25 women, mean age 78) with a diagnosis of AD (N=33), vascular dementia (N=7) or a mixed diagnosis (N=10) were enrolled. The objectives of the trial were the immediate effects of SMST on the behaviours of older people with dementia, the carryover effects of SMST on mood and behaviour to day-hospitals and home environments and the maintenance effects of SMST on mood, behaviour and cognition over time. The effects of SMST on behaviour were measured by INTERACT.119 The generalisation effects were measured by three outcome measures: the carryover effect of day-hospitals was measured with the General Behaviour and Community Skills subscales of REHAB (Baker 1988); the carryover effect to home, at midintervention and postintervention, was measured with the Behaviour and Mood Disturbance Scale (BMD) and the Behaviour Rating Scale (BRS) of the Clifton Assessment Procedures for the Elderly (CAPE). The maintenance effect (at the 1-month postintervention follow-up) on behaviours and cognition were measured by REHAB, BMD, the Cognitive Assessment Scale (CAS) of CAPE and Mini-Mental State Examination (MMSE). No significant effects on any scale of behavioural symptoms were found either immediately after intervention or at 1-month follow-up. The second study120 was a quasi-experimental pre-test and post-test design with cluster randomisation performed at a ward level, which compared a 15-month, 24-hour individualised care plan that was integrated with SMST, with 15-month usual care. The study included 136 participants diagnosed with AD, vascular or mixed dementia from three different countries (UK=94 day patients, the Dutch sample=26 inpatients. Swedish sample=16 inpatients). There was a significant group difference in the mean baseline MMSE scores (data from the UK and the Dutch only) between the SMST group (9.4) and the control group (6.7) (p=0.01). All participants attended eight, 30-min sessions on a one-to-one basis according to their group assignment. The sessions were conducted by the same key workers throughout the study period. The following outcomes measured the short-term effects of SMST on behaviours: (1) INTERACT (22-item) measured behaviours during the sessions; (2) INTERACT (12-item) measured behaviours 10 min before and 10 min after the sessions and (3) Behaviour Observation Scale for Intra-mural Psycho-Geriatrics (GIP) measured behaviours that were videotaped during the sessions in the Netherlands sample. The study showed significant effects on two behavioural items of INTERACT during sessions: enjoying oneself (MD=−0.74; 95% CI (−1.29 to −0.19); z=2.62, p=0.01) and bored/inactive (MD=−0.56; 95% CI (−1.11 to −0.01); z=1.99, p=0.05). There were no longer term treatment effects of the integrated SMST-care programme on behaviour. The third study121 ,122 assessed the effects of SMST when integrated into 24-hour daily care on nursing home residents with dementia. A total of 125 patients with moderate or severe dementia and care dependency were recruited from six old age psychiatry wards for pre-test. A cluster randomised design was used to assign the wards to either experimental (integrated SMST-care programme) or control (usual activity) conditions. Twelve old age psychiatry wards in six nursing homes (out of 19 homes) were recruited to the study. At baseline, 125 participants (woman 79%, mean age 84) were recruited and were assigned to experimental or control conditions according to the ward in which they stayed. For the experimental group, participants were given a stimulus-preference screening in 10 weekly one-hour sessions to identify their preferred sensory stimuli. Subsequently, individual SMST-care plans were developed for each participant based on their life history, stimulus preference and discussions from multidisciplinary conferences. Certified nursing assistants (CNAs) used multisensory stimuli in the 24-hour care of the experimental participants. Participants in the control group were provided with individual usual care. A minimum period of 3 months was used for experimental and control conditions. The short-term effects of the integrated SMST-care programme on behaviours were measured using a modified version of INTERACT, in which six items were deleted and eight new items were added during morning care sessions. The long-term effects of integrated SMST-care programmes on behaviours, mood and interaction were evaluated at the 18-month follow-up using the eight items of GIP for apathy, anxiety and disoriented behaviours, the Dutch version of CMAI for agitated behaviours, physically non-aggressive behaviour and verbally agitated behaviours and the Cornell Scale for Depression for depressive symptoms. In terms of behavioural disturbances, when compared to the control, the 24-hour integrated SMST-care programme122 showed a significant effect on two behavioural items of INTERACT during sessions: enjoying self (MD=−0.74; 95% CI (−1.29 to −0.19); z=2.62, p=0.01) and bored/inactive (MD=−0.56; 95% CI (−1.11 to −0.01); z=1.99, p=0.05). There were no longer term treatment effects of the integrated SMST-care programme on behaviour. In terms of mood, there were significant improvements in one mood item of INTREACT during sessions: the SMST group was happier and more content than the control group (MD=−0.84; 95% CI (−1.39 to −0.29); z=2.98, p=0.003). There were no significant effects of the 24-hour integrated SMST at postintervention. The fourth review scored 6 in the AMSTAR evaluation and investigated different non-pharmacological interventions including SMST for the treatment of BPSD.29 The review identified only one study that was included in the above cited review.122 Online supplementary etable 6 describes SMST-based interventions, outcomes and results of the primary studies included in the reviews. TENS is a simple, non-invasive, non-pharmacological intervention commonly used for pain control123 and occasionally for neurological and psychiatric conditions such as drug/alcohol dependency, headaches and depression.31 TENS consists of attaching electrodes to the skin and applying an electrical current, whose frequency can vary from low (<10 Hz) to high (>50 Hz). Two reviews were identified. One review that evaluated current treatment options for sleep disturbance in AD scored 3 in the AMSTAR evaluation.124 Different non-pharmacological interventions were considered, including bright light therapy, behavioural and multifaceted interventions (combined increased daytime physical activity and exercise, decreased daytime in-bed time, daily sunlight exposure, structured bedtime routine and decreased night-time noise and light) and TENS. For the latter intervention, only one randomised trial of 19 nursing home residents was identified. The study did not evaluate behavioural outcomes. A Cochrane review that was included in O'Neil's review31 was also considered.125 The review was focused only on RCTs that enrolled inpatients and outpatients of any age (with or without caregivers), with a diagnosis of dementia. The outcomes of interest included visual and verbal short-term and long-term memory, semantic verbal fluency, circadian rest-activity rhythm, affect/depression, level of independent functioning, adverse effects and dropouts due to inefficacy. The review identified and included nine trials that were performed in Japan and the Netherlands. The Dutch studies were performed by the same group of authors.126–131 These studies were randomised placebo-controlled trials, and the participants were chosen from a group of 350–500 residents of a residential home for older people. The age range of the participants was ∼70 to mid-90 years and were mostly women (>80%). All participants met NINCDS-ADRDA criteria for the clinical diagnosis of probable AD; most participants had early AD, but some had moderate AD. Participants generally had scores of 17 or less on the Hamilton Depression Rating Scale. All included studies used a similar TENS protocol, except the most recent one published in 2002, which addressed cranial electrostimulation. The remaining three publications were performed by a group of authors from Japan and describe the results of the same study.132 The study design was a double-blind crossover and, in contrast to the Dutch studies, participants were thought to have multiinfarct dementia or AD and were selected on the basis of irregular sleep-wake patterns in conjunction with nocturnal behaviour disorders and/or dementia. Twenty-seven participants completed the study. The intervention used a HESS-10 stimulator with rectangular pulse waveforms at a frequency of 6–80 Hz, a pulse duration of 0.2 ms maximum, 256 µAmps and an amplitude of 6–8 V. The outcomes evaluated were sleep disorder, motivation, behaviour disorder, intelligence, emotion, language, neurological signs, subjective symptoms and activities of daily life. All of these were rated on a five-point scale: absence of the related symptom, 0; mildly disturbed, 1; moderately disturbed, 2; markedly disturbed, 3 and severely disturbed, 4. Of the nine studies, only three could be included in a meta-analysis for a combined total of 63 participants. Two of these studies were conducted in the Netherlands, and one was conducted in Japan. Results, however, were inconclusive. It should be noted that none of the other studies mentioned adverse effects, although it is unclear if adverse events were monitored. Online supplementary etable 7 describes TENS-based interventions, outcomes and results of the primary studies included in the reviews. Woods 2012133 (AMSTAR score=10) was a Cochrane review that identified 15 RCTs that used cognitive stimulation for people with dementia. The authors stated that most of the studies were of low quality, but that generally, investigators had taken measures to protect against the risk of allocation concealment bias. In a meta-analysis of three trials140–142 (n=190 participants), the intervention had no effect on problem behaviours (SMD −0.14, 95% CI −0.44 to 0.17; I2=0%, p=0.57). The review by Aguirre et al in 2013134 (AMSTAR score=5) evaluated the effectiveness of cognitive stimulation in patients with dementia and identified nine RCTs. Three trials that considered behaviour-related outcomes were identified. These trials were already included in Woods's review133 and reached the same conclusion. Alves et al in 2013135 (AMSTAR score=4) identified four RCTs of cognitive interventions for AD patients. Only one trial that measured BPSD as an outcome was identified. The study population was composed of 32 patients with a score between 10 and 24 on the Mini Mental State Examination, no history of antidepressant medication and a total NPI score >5 points arising from at least 2 domains of behaviour. The cognitive stimulation intervention was administered individually and focused on a set of tasks requiring executive functions and working memory. The study found a statistically significant reduction of BPSD (MD −2.06; 95% CI −2.91 to −1.21). The study of Carrion et al in 2013136 (AMSTAR score=4) found 17 RCTs of cognition-oriented interventions (reality orientation and skills training) for dementia sufferers. Challenging behaviour was evaluated in only two trials (n=156 and n=44, respectively) that employed the two categories of cognitive interventions, using the NPI and the Revised Memory and Behaviour Problems Checklist. In both RCTs, the intervention group had a smaller increase in change from baseline compared to the control group. Owing to the heterogeneity among the studies, the authors decided a meta-analysis was inappropriate. Yu 2009137 (AMSTAR=3) included 15 studies (9 RCTs, 5 CCTs and 1 before–after study), in addition to 5 case studies and 3 undefined studies, all of which investigated different types of cognitive interventions for AD and dementia. The only study, a CCT (n=32 with early-stage AD), that evaluated the effect of cognitive stimulation on behavioural disturbances, showed larger improvement than the cognitive training group. Olazarán et al in 2010138 (AMSTAR=4) identified 179 RCTs of diverse types of non-pharmacological interventions for AD patients and examined problem behaviour, mood, QoL, cognition, ADLs, mechanical restraint and institutionalisation of patients and mood, psychological well-being and QoL of CGs. The authors performed a meta-analysis of three low-quality RCTs to determine the effect of cognitive stimulation on problem behaviour and mood. There was a non-statistically significant reduction in problem behaviour (group session cognitive stimulation (ES=0.61; 95% CI 0.09 to 1.12)). The primary study by Baines et al140 was included in the Woods133 review above, while the study by Robichaud et al143 was included in the review by Kim144 which examined behaviour management techniques described below. Thirty-three RCTs, employing cognitive interventions for cognitively impaired individuals (dementia and mild cognitive impairment), were identified in Kurz et al145 (AMSTAR score=2). Twelve of these trials examined behavioural disturbances, but only three studies found a significant effect of the intervention. Zientz et al139 (AMSTAR score=2) identified three studies (two RCTs and one RCT or CCT; n=124 participants) of caregiver-administered cognitive stimulation for individuals with AD. One of the randomised trials (n=16) found that individuals who received the intervention displayed fewer behavioural problems compared to those who had not been given the intervention. Online supplementary etable 8 describes cognitive stimulation-based interventions, outcomes and results of the primary studies included in the reviews. The second review147 was focused only on reminiscence therapy as a sole treatment of behavioural outcomes for patients with dementia. The review was of low methodological quality (AMSTAR score=3). The results were presented in a narrative synthesis. The review included five trials with a before–after design, containing 258 patients affected by dementia. The studies considered different interventions. Two studies (one with 31 participants (Haight 2006)150 and the other with 17 participants (Morgan 2010151)) assessed a life review or story approach and found significant improvements in depression, communication, positive mood and cognition. The third study (101 participants (Lai 2004152)) evaluated specific reminiscence, which produced a life-story book using personalised triggers for each person's life history. No significant differences were observed between groups except for outcomes such as well-being and social engagement. The remaining two trials (involving 73 participants153) and 36 participants154) evaluated individual reminiscence approaches. One study used six weekly sessions, which focused on a particular life phase, such as childhood or family life, while the other study used a basket of visual and auditory activities, based on five themes, such as musical instruments, designed to stimulate reminiscence. No significant differences were observed between the groups in terms of behavioural outcomes. The third review146 focused on whether reminiscence therapy could alleviate depressive symptoms in adults with dementia, but its methodological quality was extremely low (AMSTAR score=1). Four primary studies with a pre–post-test design were included and were described individually, three of which were randomised trials and one of which comprised a single group. Online supplementary etable 9 describes reminiscence therapy interventions, outcomes and results of the primary studies included in the reviews. Validation therapy is based on the general principle of the acceptance of the reality and personal truth of another person's experience and incorporates a range of specific techniques. Validation therapy is intended to give the individual an opportunity to resolve unfinished conflicts by encouraging and validating the expression of feelings. The specific interventions and techniques are based on a synthesis of behavioural and psychotherapeutic methods. The approach can be used as a structured therapeutic activity in a group setting, usually lasting several weeks, or it can be conducted individually as part of an ongoing approach to facilitate communication as a supplement to group work. The validation therapy techniques comprised non-threatening, simple concrete words; speaking in a clear, low and empathic tone of voice; rephrasing and paraphrasing unclear verbal communication; responding to meanings through explicit and implicit verbal and non-verbal communication and mirroring verbal and non-verbal communication. Among the primary studies, the first study156 (n=31) was performed in a nursing home and used an intervention (30 min once-per-week for 6 weeks) that included activities such as discussion of a previously agreed subject, singing and movement, followed by a closing ritual and refreshments. Behaviour was measured with the Behaviour Assessment Tool. The control groups consisted of reminiscence therapy, which followed the guidance of a reality orientation manual (cues such as flannel boards and calendars were used to promote orientation) and usual care. At 6 weeks, validation therapy was associated with a decrease of problem behaviours (MD=−5.97, 95% CI −9.43 to −2.51; p<0.001; based on an analysis of participants who completed the study). The second study157 enrolled 36 patients with moderate-to-severe disorientation of which 25 had a diagnosis of dementia. The study was performed in a LTC institution in the USA. The validation therapy was performed twice-a-week for 9 months; details of the validation therapy were not given. Agitation was measured using the Minimal Social Behaviour Scale (MSBS; Farina 1957) where a reduction in score indicated improvement. No effects on behaviour were detected. The last study158 was carried out in ‘skilled-care nursing homes’ in the USA. In this study, patients were included if they had at least a moderate level of dementia (assessed by the Short Portable Mental Status Questionnaire—SPMSQ—and the Validation Screening Instrument) and displayed problem behaviours, such as physical aggression. Validation therapy (four meetings lasting 30 min per week for 52 weeks) was composed of groups divided into four sessions of 5–10 min each. The first session included introductions, salutations and singing. The second session involved conversation regarding a subject of interest; recalling past events was promoted. The third session comprised an activity programme and singing or poetry. The fourth session involved refreshments and individual goodbyes. Agitation was measured with the CMAI,160 carried out as CMAI(N) nurse observed and CMAI(O) non-participant observed. The authors reported that depression (MOSES) decreased at 12 months (MD −4.01, 95% CI −7.74 to − 0.28; p=0.04, based on an analysis of participants (66 out of 88) who completed the study. Online supplementary etable 10 describes validation therapy interventions, outcomes and results of the primary studies included in the reviews. The first review was written by only one reviewer and scored 3 on the AMSTAR Scale. The review was aimed at investigating the effectiveness of SPT for challenging behaviours in dementia. The review searched PubMed, PsycINFO and the Web of Science, conducted hand searches of relevant articles and considered for inclusion, studies that reported pre-test and post-test, or pre-test and during-test data for SPT for challenging behaviours. The SPT consisted of audio or videotapes prepared by a spouse, family members, the caregiver, a psychologist, a surrogate or researchers. Of the seven included primary studies, only the data from four could be pooled, showing an overall mean effect of 0.70, with a 95% CI of 0.38 to 1.02, but with statistically significant heterogeneity (I2=71%, p=0.02). The second review examined the efficacy of any non-pharmacological intervention (including SPT) to reduce BPSD in patients with dementia.162 After searching the databases MEDLINE, CINAHL, PsycINFO, EMBASE, Dissertations International and the Cochrane Database of Systematic Review, from 1974 to May 2008, the review identified only two studies that were included in the Zetteler review above.30 Online supplementary etable 11 describes SPT, outcomes and results of the primary studies included in the reviews. There is a multitude of behavioural interventions that constitute behavioural management techniques, which include behavioural or cognitive–behavioural therapy, functional analysis of specific behaviour, individualised behavioural reinforcement strategies, communication training and other therapies such as habit training, progressive muscle relaxation and token economies. These behavioural interventions can be realised either with the patient or by training caregivers to perform the intervention with the patient. One overview of reviews and four SRs that considered behavioural interventions were identified. 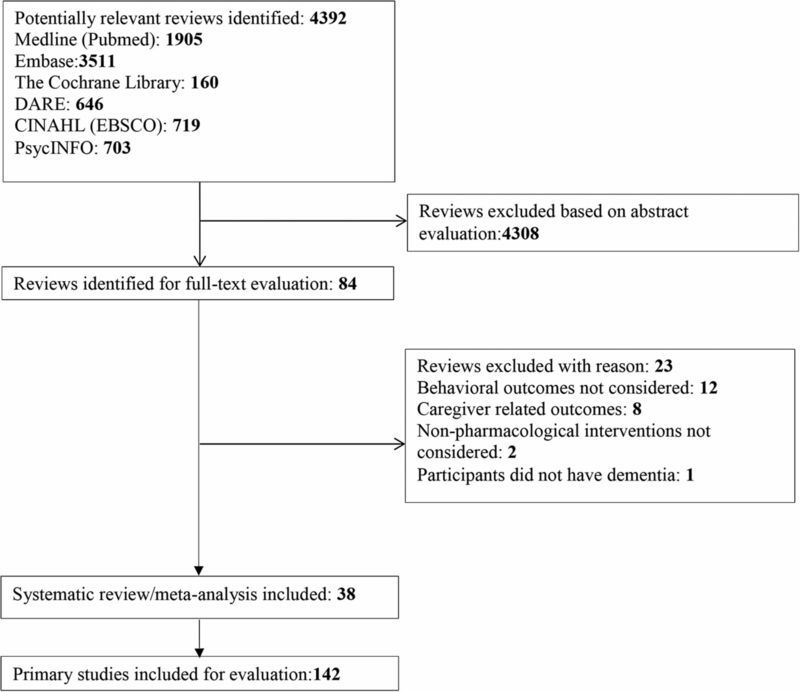 The overview of reviews by O'Neil 201131 identified three SRs, and after performing additional searches of primary studies, included nine randomised trials.163–171 The overview authors' conclusions were in support of behavioural management techniques as effective interventions for behavioural symptoms of dementia although they admitted there were mixed results. In addition, the authors highlighted some concerns regarding the variety of specific interventions and methodological limitations in many studies and advocated additional research with carefully assessed outcomes. A Health Technology Assessment (HTA)172 report that aimed to evaluate the clinical and cost-effectiveness of sensory, psychological and behavioural interventions to manage agitation in older adults with dementia, systematically searched and identified four randomised trials.166 ,173–175 The intervention in all four trials was caregiver-based. The HTA authors concluded that the evidence in favour of the behavioural management techniques was limited. A Cochrane review176 aimed to assess the effects of functional analysis-based interventions for people with dementia (and their caregivers) living in their own home or other settings and identified 18 randomised trials. The development of the intervention was driven by various approaches and theories, including knowledge and/or training approaches, the stress-coping model, the progressively lowered stress threshold model and problem-solving approaches. In addition, the time frame in which the intervention was delivered varied from 9 days to 18 months and the number of sessions used to deliver the intervention varied widely, from 1 to 2 sessions to more than 10 sessions. Of the 18 studies included,164–168 ,173 ,174 ,177–187 the authors were able to meta-analyse data from 4 trials,178 ,180 ,182 ,188 of which one contained unpublished data. There were no significant reductions in the incidence of challenging behaviours reported postintervention in four family care studies (SMD 0.02, 95% CI −0.13 to 0.17, p=0.80, N=722). Among 179 RCTs of diverse types of non-pharmacological interventions for AD patients, identified by Olazarán 2010138 (AMSTAR score=4), the authors performed a meta-analysis of three low quality RCTs of behavioural interventions (analysis and modification of antecedents and consequences of behaviour) and found a statistically significant reduction in problem behaviour (ES=0.57, 95% CI 0.21 to 0.92; 3 trials; n=167). The same authors carried out another meta-analysis of four low-quality RCTs of care staff training in behavioural management and found a reduction in problem behaviour (ES=0.22, 95% CI 0.02 to 0.43; 4 trials; n=370). Kim et al144 conducted a review to assess the effectiveness of occupational therapy on behavioural problems and depression in patients with dementia. MEDLINE, CINAHL, ProQuest and The Cochrane Library were searched up to the end of March 2011. The AMSTAR score was 7. The authors defined occupational therapy as an application of ‘activity analysis, caregiver training, sensory stimulation, behaviour control skill teaching, physical and social environmental modification, cognitive training, and purposeful activity’. The review identified nine randomised trials with a total of 751 participants. On the basis of the type of intervention, the authors categorised four studies118 ,120 ,143 ,198 as sensory stimulation, three studies198–200 as functional task activities and two studies200 ,201 as environmental modification. The authors performed a meta-analysis of the trials with occupational therapy-based sensory stimulation and found an ES of 0.32 (95% CI 0.04 to 0.59; 250 participants; no significant heterogeneity). No significant effect was detected for OT-based functional task activities (0.15, 95% CI −0.17 to 0.47; 203 participants) or environmental modification (0.13, 95% CI −0.09 to 0.36; 298 participants). Characteristics of the interventions varied greatly across the trials. Fifteen trials were focused on enhancing communication skills in family and formal caregivers. Eighteen trials focused on functional activity of which four were described as a behavioural management intervention. The intervention in one trial involved caregiver training on verbal or non-verbal communication focused on activities of daily living. Another trial was dedicated to teaching participants the basic technique for progressive muscle relaxation.170 Time delivery of the intervention also varied widely. However, as noted by Moniz-Cook, the intervention delivery was determined by setting: the interventions in care homes were provided weekly and lasted for 6 months.176 In one family care study, the intervention was provided in just 4 sessions over 8 weeks.173 Follow-up data varied from a few weeks to 24 months. The remaining two trials evaluated behavioural management techniques. Teri 2000174 compared the intervention consisting of eight weekly and three biweekly sessions (high-intensity intervention) with pharmacological interventions or placebo. The intervention was provided by a therapist with a master's degree and 1-year clinical experience, but was not reported in detail. The postintervention evaluation started at 4 months, and the follow-up lasted beyond 12 months. The second study173 did not completely describe the intervention for behavioural management. The intervention was delivered in four sessions (moderate intensity) over 8 weeks by the trial investigator. When the frequency of challenging behaviours was examined, none of the studies detected a significant difference even when a meta-analysis, using the data from 10 studies, was performed (SMD −0.05, 95% CI −0.17 to 0.07). Assisted living: In this setting, people with dementia lived in a residence, did not require full-time nursing care, but needed assistance with some ADLs, such as bathing, dressing and eating. Family members could still act as intermittent caregivers during visits by providing different types of support for ADLs, instrumental ADLs (eg, laundry washing, room cleaning, transportation to a doctor's office), socioemotional support (eg, talking, reminiscing, socialising), monitoring care provision or advocating.202 One study evaluated a behavioural management intervention to improve caregiver training to manage residents with dementia.166 The intervention intensity was medium-high, delivered by a clinical psychologist and graduate nursing students who performed two half-day group workshops and four individualised sessions with a follow-up 2 months after the termination of the intervention. Results for residents showed a statistically significant effect, in intent-to-treat analyses, in favour of the STAR-caregivers (STAR-C) intervention, general behavioural disturbance (measured by the Revised Memory and Behaviour Problems Checklist (RMBPC), NPI and ABID) and depression. In 15 residential care sites across metropolitan areas in Sydney (Australia), Chenoweth et al179 examined the efficacy of person-centred care versus usual care. The intervention was a high-intensity, person-centred care, based on the needs-driven model in which staff, selected by managers, administered training sessions to caregivers. The topics covered during the sessions were derived from Bradford University's training manual. The duration of the intervention was 4 months, and the overall follow-up was 8 months. The total number of residents enrolled was 289. During follow-up, the mean agitation score (measured with the CMAI) in the person-centred care group decreased significantly, from 47.5 (9.1) at baseline, to 37.2 (9.1) at 6 months (p=0.01), compared to usual care in which agitation increased from 50.3 (6.8) at baseline to 57.7 (6.8) at 6 months (p value not reported). In 12 residential homes, Fossey 2006181 allocated 346 residents to an intervention that consisted of training and support delivered to nursing home staff over 10 months, focusing on person-centred care and skill development for the management of agitated behaviour in dementia. The comparison intervention was usual care. The high-intensity intervention was delivered during the whole period of follow-up (12 months) by a psychologist, an occupational therapist or a nurse supervised weekly by the trial investigators. The study's main outcome measure was mean levels of agitated and disruptive behaviour measured with the CMAI, but no significant difference between the groups was detected. In 10 residential homes, Proctor 1999165 allocated 120 patients to a staff-based intervention or usual care. The intervention, of high-medium intensity, consisting of training on “psychosocial management of residents’” behavioural problems, was delivered through seven, 1-hour seminars by members of the hospital outreach team and psychiatric nurse during the whole period of follow-up (6 months). The seminars covered topics that the staff had identified to improve their knowledge and skills (eg, management of dementia, aggression, etc). The Crichton Royal Behavioural Rating Scale was used to assess behavioural characteristics of residents (0=no problems, 38=severe problems). In addition, the geriatric mental state schedule and the diagnostic algorithm AGECAT (Automatic Geriatric Examination for Computer-Assisted Taxonomy) were used to assess the effect of the intervention on residents' organic and depressive symptoms. Despite the control group having mean scores on the Crichton Scale higher than the intervention group at follow-up, this difference was not statistically significant (mean score −0.7 (−3.0 to 1.6)). Although the clustered trials reported different types of interventions, intensities, durations and follow-up times, Moniz-Cook et al176 attempted an analysis using two studies and found a significant reduction in behavioural disturbances (SMD, −0.21, 95% CI −0.39 to −0.03; p=0.02; I2=9%). Online supplementary etable 12 describes behavioural management technique-based interventions, outcomes and results of the primary studies included in the reviews. Collet 2010203 (AMSTAR score=5) carried out a SR in MEDLINE, PsycINFO and PubMed to determine the efficacy of interventions that combined psychiatric and nursing home care in nursing home residents. The authors identified 4 RCTs (n=371 participants), 1 retrospective cohort study and 3 prospective case studies. All the studies used tailored treatment plans that combined psychosocial, nursing, medical and pharmacological interventions. The results of the RCTs were described narratively. Three out of the four randomised trials reported an improvement in behaviour and mood, while one trial found no difference among the groups (online supplementary etable 13). A SR204 that evaluated the effective characteristics of residential LTC settings for people with dementia identified one controlled clinical trial.205 The intervention in this trial was provided in five nursing homes and consisted of 15 agitated participants with dementia taking showers, 15 agitated participants with dementia taking walks in an environment where natural elements such as large bright pictures coordinated with audio, including bird songs, bird pictures, the sound of water flowing gently, as well as food (such as banana, pudding and soda). The control group consisted of 15 other agitated participants with dementia that received only usual care. Agitation was measured with a modified version of CMAI. The analysis showed a significant decline in agitation in the treatment group with respect to the comparison group. Another review72 that aimed to assess the role of physical environment in supporting person-centred dining in LTC identified another trial206 that was not included in the previous reviews. This trial applied an experimental 3×3 repeated measures design and included 41 residents with dementia living in three SCUs. Participants were mostly women (78.0%), with a mean age of 84.5 years (SD=6.0). Residents in the treatment group received each of three treatments (hand massage, favourite music and the combination of both) with each treatment lasting 10 min; the control group did not receive any treatment. The CMAI was used to measure agitation. The results showed that each single and combined treatment were effective in significantly decreasing agitation immediately following the intervention and one-hour postintervention. Online supplementary etable 13 describes multicomponent interventions, outcomes and results of the primary studies included in the reviews. The systematic search identified two reviews207 ,208 that evaluated the efficacy of only exercise as a therapeutic intervention. The review by Potter et al207 received 6 points in the AMSTAR assessment and identified 13 randomised trials that evaluated the effects of physical activity on physical functioning, quality of life and depression in older people with dementia. Only four of these trials investigated depression as an outcome using four different rating scales (Geriatric Depression Scale (GDS15); Montgomery-Asberg Depression Rating Scale (MADRS); a Dutch Evaluation scale for older patients (subscale used) and the CSDD) and two trials measured behavioural disturbances (NPI and Stockton Geriatric Rating Scale). The review authors stated that the methods of randomisation were clear and adequate in six of the trials with only three of these also providing methods of allocation concealment; eight of the trials reported information regarding losses to follow-up and six trials declared intention-to-treat analysis. The first study, Burgener 2008,209 was a small trial (n=43) carried out in community-dwelling older people with dementia. The intervention was multimodal comprising Tai Chi (sitting and standing; 60 min, 3 times-a-week for 40 weeks) and cognitive–behavioural therapies. Depressive symptoms were measured with the GDS15. The authors reported that at 20 weeks of observation, there were no statistical differences between the groups. The second study, Rolland 2007,210 was a larger trial (n=134) carried out in nursing homes. Participants performed exercises including stretching, walking, strength, flexibility and balance training for 60 min, 2 times/week for 40 weeks. Depression was evaluated using the MADRS. After 12 months of observation, the MADRS score (13.4±8.0) was higher in the intervention group than in the control group (14.8±7.2), but without any statistical difference. The third study103 was also a small study (n=25) conducted in a psychiatric hospital. The invention was composed of strength, balance and flexibility exercises with music, 30 min daily for 12 weeks. Depression was measured in older patients with the subscale Beoordelingsschaal voor Oudere Patienten. At 3 months follow-up, no significant difference in depressive behaviour was observed. The last study164 was a larger trial (n=153) that enrolled community-dwelling patients and their caregivers. The exercise intervention, for patients, comprised aerobic, endurance, strength, balance and flexibility training, 30 min twice weekly, reducing to twice monthly, for 23 weeks. Caregivers were given training in behavioural management techniques. The CSDD was used to assess depression. At a 2-year follow-up, the mean difference was 2.14 (95% CI 0.14 to 4.17) and statistically significant in favour of the intervention. The four trials used different types of interventions, outcome measures and follow-up times that hindered the possibility of performing meta-analyses. The two randomised trials103 ,210 that considered behavioural disturbances used the NPI and Stockton Geriatric Rating Scale, respectively. The second review by Thuné-Boyle et al208 received an AMSTAR score of 2 and included six studies comprising two small randomised trials (n=31), two prospective design and two repeated measures studies that examined the effect of exercise on BPSD. In the first trial (Hokkanen 2003), the exercise intervention consisted of 16 sessions of dance and rhythmic movement lasting 30–45 min, once-a-week. This trial was already discussed in the dance section. The second trial211 aimed to assess the efficacy of a home-based exercise intervention programme to improve the functional performance of patients with AD. The intervention consisted of a daily programme of aerobic, balance and flexibility and strength training, given to patients and caregivers. Depression and apathy were measured using NPI and the CSDD at 6 and 12 weeks. Online supplementary etable 14 describes exercise therapy, outcomes and results of the primary studies included in the reviews. One review212 performed a comprehensive literature search in PubMed, EMBASE and PsycINFO to identify pertinent studies that evaluated the efficacy of animal-assisted therapy (AAT) in older patients with dementia or other psychiatric disorders. The authors identified 23 eligible studies of which 18 recruited patients with dementia, but only 10 studies investigated the effect of AAT on BPSD. The design of the studies was as follows: 3 case–control and 7 repeated measures (eg, interrupted time series analysis) studies. Overall, the authors concluded that AAT may have positive influences on patients with dementia by reducing the degree of agitation and improving the amount and quality of social interaction. However, they advocated more research examining the issue of optimal AAI duration, frequency of sessions and suitable target group. Churchill et al213 included 28 residents of three SCUs with dementia (25% women; mean age 83.8 years; dementia evaluated with Bourke Dementia Rating Scale). The authors administered pet-therapy visits during the difficult ‘sundown’ time to examine the effect on residents with a history of agitated ‘sundowning’ behaviour. The active group was exposed to 30-min interaction with an investigator and a dog, which ameliorated agitated/aggressive behaviour measured with the Agitated Behaviours Mapping Instrument Scale. However, the study did not report the p values. In addition, the variability in resident response over time after the departure of the dog was not explored. The effect of dog-based AAT was also evaluated in another special care unit. McCabe et al214 enrolled 22 participants with dementia (women 68%; mean age 83.7, range 68–96 years). The study introduced a resident dog and agitated behaviour was measured using the Nursing Home Behaviour Problem Scale. Data were collected 1 week before and for the first 4 weeks after introduction of the dog. The authors reported a significant reduction in daytime behavioural disturbances among residents, but not during evening shift. In a small pilot study, Richeson215 evaluated visiting therapy dogs in 15 residents with dementia (14 women; age range 63–99 years; dementia MMSE mean score: 3.9; 26% with depression). The session with visiting therapy dogs lasted 1 hour daily for 3 weeks. Agitated behaviour, measured with the CMAI, decreased significantly after 3 weeks and increased significantly after 2 weeks washout subsequent to the end of AAT. Libin and Cohen-Mansfield216 assessed the efficacy of a robotic cat (NeCoRo) and a soft toy cat in reducing agitated behaviour in nine women with moderate dementia in nursing homes. The intervention consisted of two, 10-min interactive sessions on different days. The robotic cat produced a significant increase in pleasure and interest, but did not reduce agitation. Conversely, the soft toy cat significantly reduced agitation. Motomura et al217 included 8 women (mean age 84.8 years) residing in a nursing home and evaluated the efficacy of AAT, consisting of two dogs visiting for 1 hour, over four consecutive days, to reduce apathy or irritability. The outcomes were measured using the Geriatric Depression Scale, Physical Self-Maintenance Scale and MMSE. The intervention did not show any significant change on any of the outcomes evaluated. Sellers et al218 included four residents with dementia to evaluate the efficacy of a visiting dog. Agitation was measured with the Agitated Behaviours Mapping Instrument and Social Behaviour Observation Checklist. The authors reported that the intervention reduced agitated behaviour during treatment and increased observed social behaviour, but data and p values were not reported. Two small (n=38) pre-post studies included in Whear's review85examined the effect of improved lighting and table-setting contrast in a dining room environment. One study219 (Brush 2002; n=25) found a positive effect on problem behaviours using the Meal Assistance Screening Tool, while the other study220 found a statistically significant reduction in daily agitation. Given the well-known negative side effects of commonly prescribed drugs to control behavioural disturbances (BPSD) in patients with dementia, non-pharmacological interventions have gained increasing attention in recent years as an alternative first-line approach to treat BPSD. This overview addresses the evidence supporting the efficacy of these interventions in community and residential care settings. We identified a number of SRs, which often focused on single interventions although, in several instances, multicomponent interventions were also examined. With the present study, using the primary studies included in the SRs, we have created a compendium of the types of non-pharmacological interventions, including the component of each single intervention, the dosage (when available) and the duration of the treatment. In the absence of a validated taxonomy, we categorised the interventions according to the following classification: sensory stimulation interventions; cognitive/emotion-oriented interventions; behaviour management techniques (further subdivided according to the recipient of the intervention, ie, the person with dementia, the caregiver or the staff); multicomponent interventions and other interventions, such as exercise and animal-assisted therapies. Among sensory simulation interventions, the only convincingly effective intervention for reducing behavioural symptoms (specifically agitation and aggressive behaviour) was music therapy. According to the most comprehensive review of music therapy, this treatment also reduced anxiety. However, the evidence supporting the effectiveness of music therapy was limited by moderate, but significant, heterogeneity, probably related to the variability of the intervention (eg, type of music, active involvement, such as singing/playing a musical instrument and dancing, or passive involvement, such as listening) and the heterogeneity of the patient population in terms of the severity of dementia and the type of dementia. The efficacy of aromatherapy and massage therapy, both associated with conflicting results, remains unknown. Light therapy and SMST therapy did not show any noteworthy effect for clinical practice. The body of evidence concerning cognitive/emotion-oriented interventions, which include reminiscence therapy, SPT and validation therapy, had important methodological limitations. The quality of the primary studies was low, as reported by the review authors, and the sample size of the studies was not powered to detect statistically significant effects. Even when it was possible to combine studies in a meta-analysis, for example, for SPT, the pooled estimated effect was not statistically significant. Added to these shortcomings was the variability in the length and type of the interventions and the multitude of outcomes measured. Overall, convincing evidence supporting the effectiveness of these psychological interventions was lacking. The most frequently assessed intervention in several trials was behavioural management techniques. The elements in this type of intervention included behavioural or cognitive–behavioural therapy, functional analysis of specific behaviour, individualised behavioural reinforcement strategies, communication training and other therapies, such as habit training, progressive muscle relaxation and token economies.31 The body of evidence supporting the effectiveness of behavioural management techniques includes positive and negative studies. Among the types of behavioural management techniques which aimed to enhance communication skills, formal caregiver training and dementia mapping provided in residential care were found to be effective at reducing agitation. The evidence was convincing when the intervention was supervised by healthcare professionals, with the effectiveness possibly persisting for 3–6 months. There is some evidence that multicomponent interventions that use a comprehensive, integrated multidisciplinary approach combining medical, psychiatric and nursing interventions can reduce severe behavioural problems in nursing home patients. Other interventions such as animal-assisted and exercise therapy did not show any convincing effect on any BPSD. Overall, the SRs had a number of methodological limitations that could have affected the confidence in the reported results. First, the heterogeneity of the types and characteristics of the interventions, even within the same class of non-pharmacological interventions, was the most significant problem that emerged from the present study. One implication is that there are serious methodological issues that question the correctness, in our opinion, of combining studies in a meta-analysis, as some authors have previously performed. Moreover, in some studies, the description of the interventions is too vague to allow a complete understanding of what was actually performed. In addition, even in cases in which the intervention is well characterised, the dosage of the intervention, and the means used for its delivery, varied considerably. For example, in the case of music therapy, music interventions such as listening to music via headphones, based on participants' musical preferences,87 differed from listening, playing percussion instruments, singing, movement or dance86 and was observed across all nine trials combined in the meta-analysis. In the case of aromatherapy, there were several essential oils that were used in the primary studies, but in some instances, even when similar components were used (eg, Melissa essential oil), the mode of administration differed among trials. Similarly, there was great variation in the intensity (from 2500 to 10 000 lux), duration (1–9 hours), frequency of exposure (10 days to 10 weeks) and type of device used (Dawn-Dusk Simulator222), when light therapy was investigated for behavioural problems in dementia. The variation in the characteristics of the interventions was particularly pronounced in the trials ascribed to behavioural management techniques. The trials used different conceptual frameworks, and sometimes broad and quite generic descriptions, to describe the interventions that at times were difficult to interpret and which influenced the content and quality of evidence of the SRs. In this area, it is therefore difficult to produce a satisfactory classification, which implies that different SRs did not consider the same group of studies, even when they clearly investigated non-pharmacological interventions specifically designed to improve behavioural management. This overview succeeded in providing a complete and up-to-date compendium of non-pharmacological interventions in older people with dementia, using recently published SRs and meta-analyses. The most promising treatments appeared to be music therapy and some behavioural management techniques, particularly those involving caregiver-oriented and staff-oriented interventions. Despite the considerable number of published articles included in this overview, the evidence supporting the efficacy of non-pharmacological interventions is limited due to methodological quality and sample size and to the presence of important variations in the taxonomy of the non-pharmacological interventions, the outcomes assessed and the tools used to evaluate the outcomes.
. A systematic evidence review of non-pharmacological interventions for behavioral symptoms of dementia. Washington (DC): Department of Veterans Affairs, 2011.
. Non-pharmacological interventions to prevent or treat pressure ulcers in older patients: Clinical practice recommendations. The SENATOR-ONTOP series. Eur Geriatr Med 2016;7:142–8.
. On the scent of a useful therapy. J Dement Care 1997;5:21–3.
. Using lemon balm oil to reduce aggression and agitation in dementia: results of a pilot study. J Dement Care 2011;19:36–8.
. Effect and significance of music therapy on elderly persons with mild dementia. 2005;5:48–57.
. A preliminary study of the effects of music therapy on agitation in Chinese patients with dementia. Hong Kong J Psychiatry 2006;16:87–91.
. Effects of nursing intervention using rhythmic exercise for patients with severe senile dementia. Nurs Res 2006;39:301–13.
. The effect of music therapy for elderly with dementia: a comparative study between large group and small group sessions. Japanese J Music Ther 2004;4:208–16.
. The effects of combined music and reminiscence therapy for small groups of the elderly with senile dementia of Alzheimer type, and the efficacy of the evaluation method. Japanese J Music Ther 2005;5:25–38.
. Snoezelen for dementia. Cochrane Database Syst Rev 2002;(4):CD003152. Baker R. & Dowling Z. (1995) INTERACT. A New Measure of Response to Multi-Sensory Environments. Research Publication. Research and Development Support Unit, Poole Hospital, Dorset.
. Transcutaneous electrical nerve stimulation (TENS) for dementia. Cochrane Database Syst Rev 2003(3):CD004032.
. Evidence-based practice recommendations for dementia: educating caregivers on Alzheimer's disease and training communication strategies. J Med Speech Lang Pathol 2007;15:liii–lxiv.
. Reality orientation therapy in institutionalized elderly patients: preliminary results. Arch Gerontol Geriatr 1991;12:139–42.
. Life review with people with dementia in care homes: a preliminary randomized controlled trial. 2010;1:43–60. Peoples. Validation therapy, versus reality orientation as treatment for disorientated institutionalised elderly [Masters dissertation]. Akron: College of Nursing, University of Akron, 1982.
. No research versus research with compromised results: a study of validation therapy. Nurs Res 1986;35:113–18.
. Psychosocial interventions to reduce depressive symptoms of dementia caregivers: a randomized clinical trial comparing two approaches. J Mental Health Aging 2004;10:337–50.
. [Differential efficacy of two psychoeducational interventions for dementia family caregivers]. Rev Neurol 2004;38:701–8.
. Using a therapy dog to alleviate the agitation and desocialization of people with Alzheimer's disease. J Psychosoc Nurs Ment Health Serv 1999;37:16–22.
. Using the environment to improve intake for people with dementia. Alzheimer's Care Today 2002;3:330–8.
. Environmental interventions and functional ability of AD patients. In: Vellas, B., Fitten, J. and Frisoni, G. eds. Research and practice in Alzheimer’s disease. Paris: Springer, 1998:185–191. Contributors IA, JMR, AC, RS, AC-J and DO conceived and designed the study. The manuscript of this protocol was drafted by IA, JMR, AC, RS, AC-J, AdG and BHM and revised by MP, AnG, FMT and GDA. IA and JMR designed the search strategies; IA, JMR, FMT and GDA performed the search, screening and assessment independently. AC arbitrated disagreements during the review. All authors contributed to data analysis and critical revision of the paper; additionally every author approved the final version. Funding The research leading to these results has received funding from the European Union Seventh Framework programme (FP7/2007-2013) under grant agreement no. 305930 (SENATOR). Disclaimer The funders had no role in the study design, data collection and analysis, the decision to publish or the preparation of the manuscript.